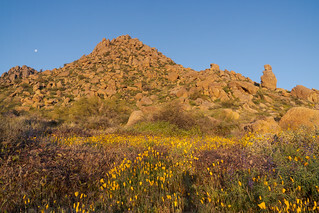 First light falls on the California poppies and Coulter's lupines blooming in front of the rock formation I call the Guardian. Haven't had much time and/or energy for hiking the past few weeks but thankful I was able to get out for a few hours last week to see the desert in bloom. This was my first time seeing the Sonoran Desert bloom like this.